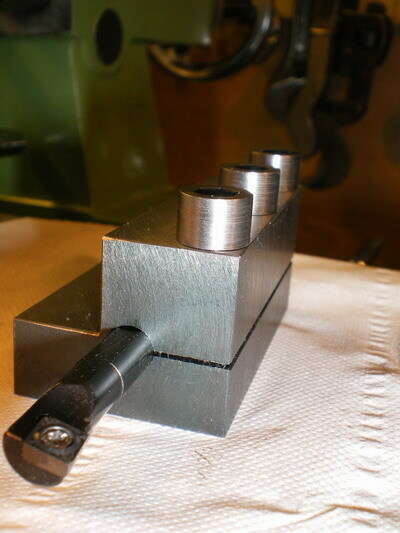 I finally got around to making a holder for the Glanze boring bar. This simple job took me morning, noon and night, and then some. 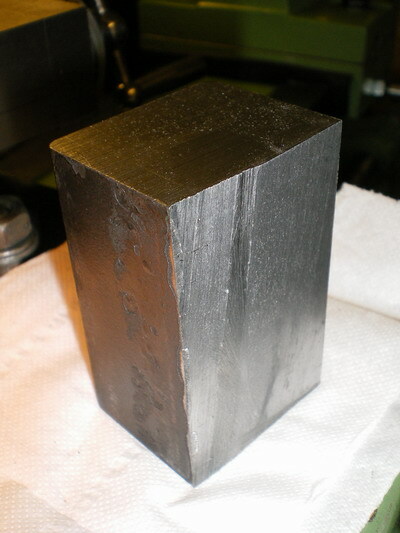 ↓ I found a block of lacquered/coated steel in the scrapbox. ↓ I milled out a step. It took ages to mill out. Next time I will use the bandsaw to roughly cut away the waste. This is a really nasty piece of steel. 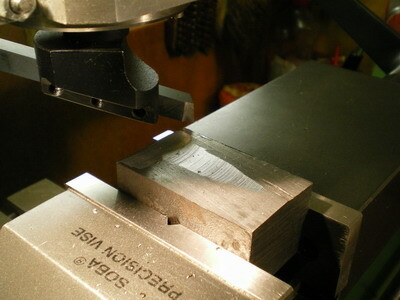 Later, after milling, I cleaned the block using the fly cutter again. 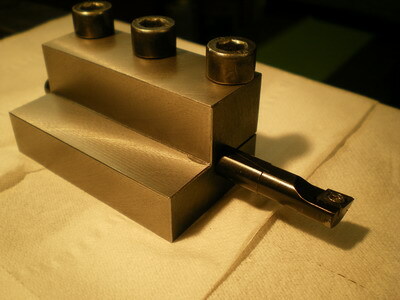 ↓ I mounted the block in the 4 way toolpost. 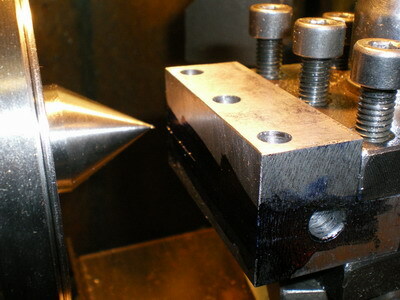 The block is held in the toolpost by the existing M8 cap head bolts. I pressed the block against a bar held in the chuck. 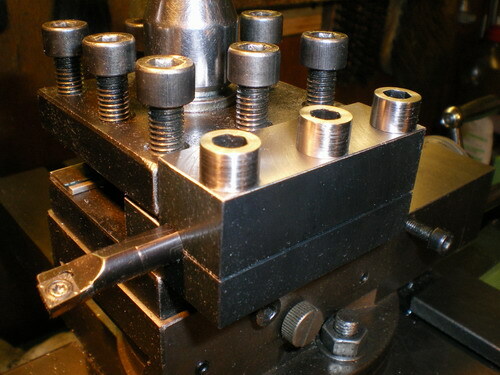 This quickly lined the block up to the chuck and lathe centre line. 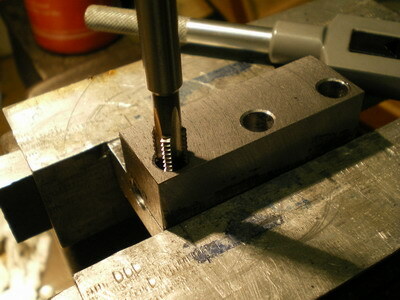 ↓ Using a drill bit mounted in the lathe chuck, I drilled a horizontal 8mm hole all the way through the block, to accomodate the Glanze boring bar. I did not have an 8mm reamer to ream the hole. It does not seem to matter. 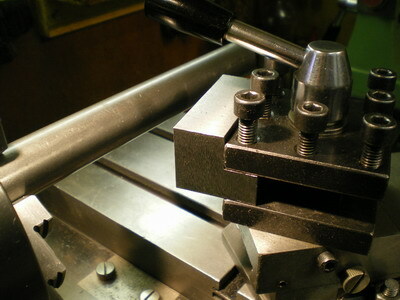 Here is the boring bar in the hole. 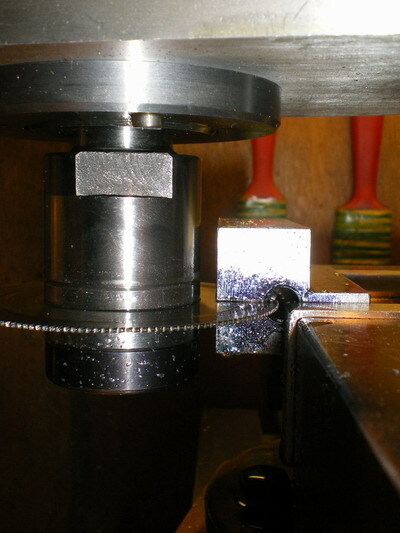 I chamfered the end of the hole, so it looks like a loose fit in this picture. 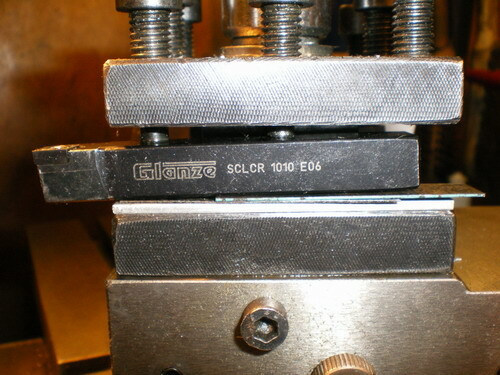 This is a Glanze boring bar. It is 8mm diameter and accepts CCGT and CCMT inserts. The CCGT inserts have a smaller tip radius and give a very good finish on most metals. ↓ I drilled 3 vertical holes for the clamp screws. 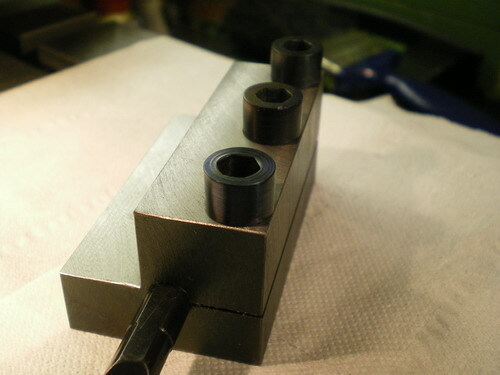 The holes are drilled 6.8mm at this stage (or 6.75mm if you like). This is the tapping size for M8. 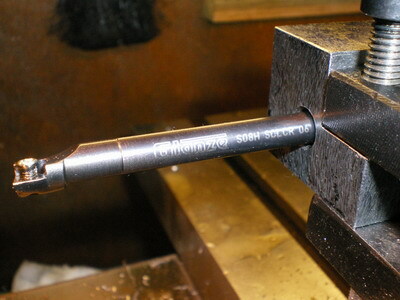 ↓ I put a center in the lathe spindle and used it to mark the block. This mark is used to line up the slitting saw. 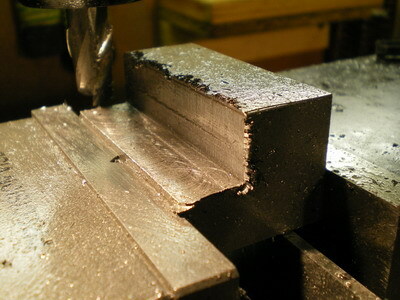 ↓ A slitting saw is used to cut the block. The slitting saw is lined up to the mark made previously. 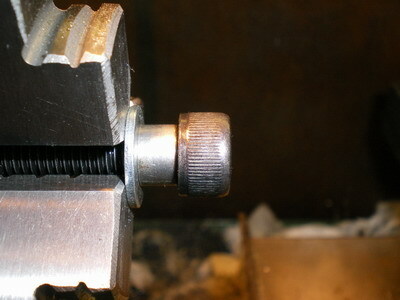 The saw is 0.04" thick (1.016mm). I ran it slowly at a few hundred rpms, with plenty of cutting oil. This is it's sixth outing and it still cuts well. I thought it would be blunt by now. I made sure I did not cut into the vice. ↓ After the slitting operation, there is now a top and bottom section to each hole. 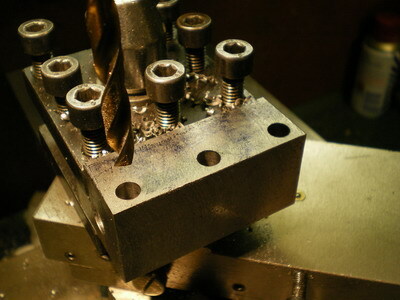 First, the top section of each vertical hole is drilled out to 8mm (being careful to leave the bottom section of each hole at 6.75mm diameter). Next, the tap is passed through the top section and the bottom section of each hole is tapped M8. Only the bottom section of each hole is tapped. This method lines up the tap very nicely indeed, because the top section of the hole keeps the tap vertical. 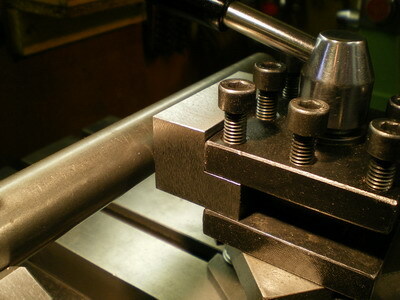 ↓ The 3 M8 cap head screws are slightly tightened and the boring bar is very firmly clamped. I originally planned on M6 cap head screws, but changed my mind and used M8 because that is the size used on the four way toolpost and so avoids having to use 2 hex key wrenches. 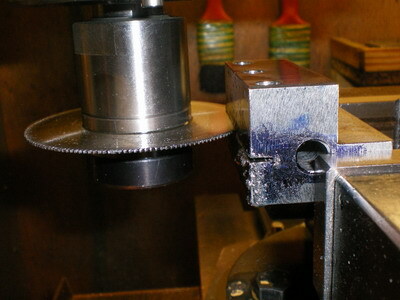 When I get around to it I will turn the head diameters down a touch, so that they are not so close to the edge. The fly cutter gave a nice finish (nicer than an end mill). The nice finish has got marked already. I think it needs 'blacking'. 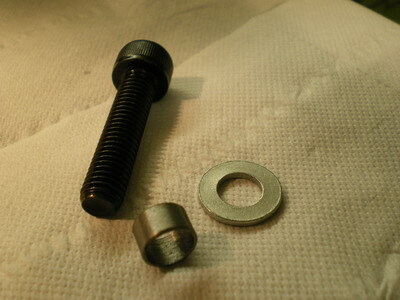 ↓ I turned the M8 cap head screws down slightly, because they overhung the edge. I wish I had taken a bit more time doing these and got a better finish. Oh well, lesson learnt. 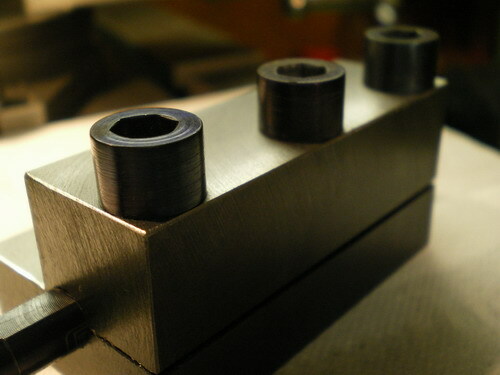 I cut a spacer, and used a washer to help turn the screw diameters down. ↓ Here it is with the screws turned down. 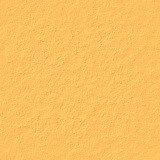 ↓ Here it is in action. ↓ The cap head screws were too shiny, so I made them blue, simply by heating them. I used a propane gas torch and slowly heated each screw until they 'just' started to turn blue; then when I removed the flame they continued to go a deeper blue color. I let them cool slowly. 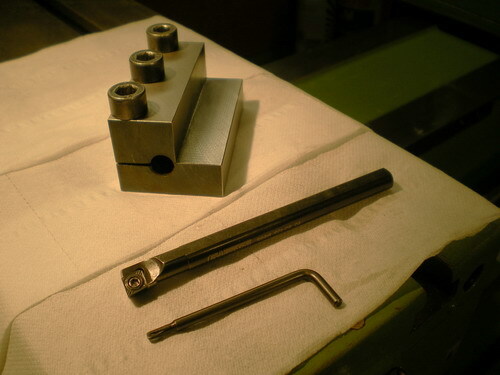 I think I would get better results if I had a really good shiny smooth finish to start with. ↓ Later that day .... I finally discovered why I was getting such a poor finish on the cap head screws and on a lot of other turning jobs I was doing at the time. The packing pieces for the tool bit holder became misaligned as I was installing them, and the carbide insert ended up pointing downwards. And there was me thinking it was the gibs, thinking it was the chuck that I had dismantled for a clean, thinking it was wrong type of carbide insert etc etc. Doh.